Quick! Hug your dog. Better yet, take her for a walk. May is National Pet Month in the U.S., a time to reflect on the value of owning a pet and our responsibility for their well-being. National Pet Month is a good opportunity for discussion, reading, and class activities that relate to pets. Most kids love animals, so it’s pretty easy to go from the “awww” factor to introducing valuable information about our domestic buddies. National Pet Month focuses on five goals. Let’s go through the goals and list things that kids can do, either individually or as a class effort. Will your school allow a dog to visit? Find a “Read to a Dog” program in your area and see if you can arrange a visit. The program, also called R.E.A.D. — Reading Education Assistance Dogs, helps kids learn to read with more confidence and less intimidation. 2. Support adoption of pets: Many kids are oblivious to the plight of our millions of unwanted and stray pets. Most humane societies have opportunities for kids to learn about the plight of abandoned or neglected pets via tours and presentations. You can bring in a volunteer to talk to your students, arrange a Skype session, or better yet, take them on a field trip to tour the local shelter. They might spend a few hours mucking stalls, cleaning cages, walking dogs, and petting cats and bunnies. Most PetSmart stores support pet adoption and host fun events, bringing together the various animal rescue organizations in the area. An offshoot of this awareness is that there is a great need for foster homes, so the more people who realize that they can help without making a long-term commitment, the better. 3. 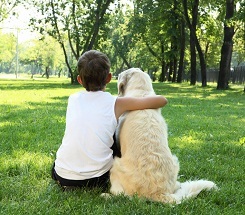 Promote responsible pet ownership: Try a personality quiz that helps determine your “best pet:” http://www.selectsmart.com/PET/ is a fun one. After the test, each child researches his or her potential pet and writes about how he or she would care for it. The activity can promote discussion about what’s the best kind of home for certain animals and how people sometimes take on more than they can take care of. Why do animals wind up in a shelter or on the streets? Do people think about how long their pet is expected to live, how big it will get, or how much it costs to feed and provide medical treatment? Do you have a classroom pet? If not, or you need help with the one/s you have, check out Pets in the Classroom (http://www.petsintheclassroom.org). They have grants available – you just fill out an application. They also have lots of helpful information. A classroom pet provides a great opportunity for kids to make a live connection with the wild world of animals. By participating in the classroom pet’s care, they learn how important it is to care and respect all life. Caring for a creature can also carry over to how kids treat each other. …and of course, any of the James Herriot books! World Vets is an international organization of volunteer veterinarians with a mission to provide veterinary aid, disaster relief and training in developing countries that otherwise have limited or no access to veterinary services. They work in 36 countries around the world. Their mission depends upon volunteers and donations. Share photos from their website (http://worldvets.org/) and talk about the importance of what they do. World Vets projects are open to volunteers of all kinds. While your students aren’t old enough yet, it’s a pretty great cause to learn about. Probably the best activity I can suggest is a fundraiser, either for a local rescue group or something such as World Vets. It can start with your classroom and grow into an all-school effort. 5. Raise awareness of the role, value and contribution to society of service animals: Training of “seeing eye dogs” began in Germany during World War I (1914-1918) when dogs were taught to help guide blinded war veterans. Dogs have since been trained to help people who are hearing impaired as well as assist people who have seizures. Horses have also been trained for the job. People who are sight impaired can ride alone on trails for many miles, knowing their four-legged steed will guide them safely to their destination. Miniature horses have the same natural ability as full sized horses, but their compact size makes them a good choice for guiding. Even pigs are being trained as guide and service animals! The little Capuchin monkey from South America is also a people-helper. The monkeys are trained to do things for people such as bringing them the phone, food, medicine or even a glass of water. They can also feed people who need assistance and help with the chores around the house and yard. The roles of these and other assistance and therapy animals are well documented. An activity could be a research project, a visit from a therapy animal, or even a trip to a service dog training session for puppies. Celebrating National Pet Month is a perfect opportunity to remind everyone about how important our pets are to us, and, how much they depend on us for their care and survival.